I booked the Four Points by Sheraton Darling Harbor for several reasons. 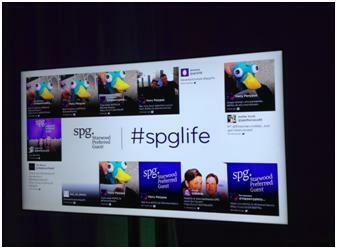 1) I’m an SPG Platinum member – free internet and breakfast. 2) I needed a hotel for NYE and they had availability 3) I’m on a business trip with a budget and they came pretty close (except for NYE and NYD night). When I booked, the only room type they had available was a city view room with two double beds. I was banking on my Platinum status for an upgrade upon arrival (I don’t think I missed out on an upgrade at all in 2011.) Well, this was where my luck ran out. It was NYE after all, and upgrades aren’t guaranteed, blah, blah, blah… but I was paying $465 for those two NYs nights. That’s a lot, I mean a whole lot, for any room at this hotel. I was given a room with a king bed (or more like two beds pushed together – that seems to be standard in Australia – instead of a room with two twin beds. I was told that I could change rooms after NY day. The city view room with king bed was exceptionally small and looked directly at a parking deck. The room was dark (poor lighting) and because it looked at a parking lot, I had to keep the blinds closed frequently which reduced the natural light. At night, it was actually so dark, that I chose not to work. The room had a desk with plenty of plugs/outlets, wired internet access (no wireless), 1 bedside lamp, a mini-bar and TV and small bathroom. The bed really left me perplexed. It had a fitted sheet and comforter – no flat sheet between the fitted sheet and comforter. Now, like everyone, I’ve heard the rumors about hotel comforters and so I called housekeeping to request another sheet. They were happy to oblige. I also read about this on Trip Advisor, seems like it was a pretty common complaint. I just don’t understand why a hotel would leave that off the bed, get complaints about it (they respond on Trip Advisor, so someone’s seen the comments) and not make a change. The bathroom, while I’m sure it was clean, had a few issues. The shower/tub had some mildew around the ceiling and the shower curtain was very old and tattered. The tub itself was scraped and had black marks in it , which gives such a bad impression – no matter how clean housekeeping gets it. When I moved rooms I was upgraded to a Harbor View Suite on the 12th floor. I requested a high floor after reading reviews. I’m glad I did. The plus side to a harbor view room is – the view. The downside is that a highway runs directly behind the hotel – in-between the hotel and harbor (don’t worry, there’s a walkway over the highway.) Most reviews noted how noisy rooms on the harbor side were when close to the highway. The suite was just as dark as the city view room – they really need to work on the lighting – but offered much more room. I had a living area with couch, chair, desk, TV/entertainment center and mini-bar. The bedroom had a king size bed, a separate dressing area with large closet and bathroom. The bathroom was much larger than the standard room bath room, but the shower/tub was no better. The views from the room were spectacular though. My room looked directly onto the Harbor and Sydney Aquarium. The hotel has room service, The Corn Exchange Restaurant and Dundee Arms Pub. The Corn Exchange is open for breakfast, lunch and dinner. Since breakfast was included for me, I did eat there a few times. The buffet was large and had many options, but was a pretty standard breakfast buffet. The eggs were runny (though you could order made-to-order eggs), the bread selection was not exciting, they offered lox, but no bagels. There was a lot of fruit, cereals, fresh honey and other healthier choices as well. At $35, not something I would pay for if it wasn’t included. I also tried the Corn Exchange twice for dinner – once because I was lazy and it was late and the second time because it was a public holiday and raining and I didn’t want to search out places that may or may not be open. I would not return to the Corn Exchange for lunch or dinner after those experiences. Apparently, the hotel is known for its seafood buffet – or so it says. I was told that the buffet was $65 for in-house guests. WHOA! $65, that’s expensive. So my first dinner was a la carte! I ordered the Tiger Prawn Ravioli with leeks and champagne citrus crème sauce. It was not good. The waitress was unfamiliar with many of the ingredients in the dishes and had to ask the kitchen for information several times. My second dinner at Corn Exchange was on New Year’s Day. The buffet was only $40 for in-house guests – for some reason – and so I opted for the buffet that night. That was a mistake. There was tons of seafood on the buffet – it’s advertised as a seafood buffet – but it didn’t look appealing to me. I opted for one of the many hot dishes – a roast beef with peppercorns – and was very disappointed. None of the desserts on the buffet were good. I tried several of them and quickly set them aside – in fact, the restaurant manger asked me about it. Later, I found myself very sick and regretted having the buffet. The Dundee Arms pub is located directly in front of the hotel. It’s in a historic looking building and offers plenty of outdoor seating. Unfortunately, all of the outdoor seating allows smoking. The Four Points runs the Pub, so sadly the food is no better than the Corn Exchange. I ordered a burger – which by the way, you order and pay for at the counter – and specified no tomato or tomato sauce (sort of like ketchup) because I am allergic. They also asked if I wanted butter – uh, no thank you. When the burger came, it took about 20 minutes, it had tomato on it. Since I’m very allergic, I sent it back. It took about 45 minutes to get a new burger. It was dry, overcooked and tasteless. I requested mustard, and what I got was so hot and spicy (reminded me of what you get at Chinese Restaurants) my eyes teared up for the next hour. I wish someone had warned me about the spice & heat. The food at the Dundee Arms Pub was about what I’ve come to expect in Australia, $22 for dinner and a drink. Luckily the dining choices at Darling Harbor are abundant and easy to access. Since I will be in Sydney for business many times over the next several years, and I’m SPG Platinum, and I certainly can’t afford the Westin Sydney on my business budget, I will likely stay at the Four Points by Sheraton again. It’s certainly wouldn’t be my first choice, or even my second choice or even third choice (those would be, in order, The Westin Sydney, The Marriott Sydney and the Holiday Inn Potts Point. Yes, the Holiday Inn. However, since I don’t collect Priority Club points, and they really don’t offer many perks for their Platinum members (which I currently am, but don’t plan to renew in 2012) I’ll likely be back at the Four Points next time I’m in town – January 21st to be specific. It’s very disappointing for Starwood and I hope they can find a way to improve the hotel. SPG Moments “Hear the Music, See the World” an intimate evening with Sara Bareilles and Perry Platypus Giveaway! Be the first to comment on "Four Points by Sheraton Darling Harbor, Sydney"